I have a love/hate relationship with Guided Reading, how about you? I LOVE working with small groups of students on exactly what they need, I LOVE the hum of a classroom alive with lots of small group work in action, I LOVE using printable leveled books to monitor the progress my students are making with reading, and I LOVE the intimacy of talking quietly with just a few students that might otherwise never be heard in the large group setting. BUT... I hate that I feel overwhelmed by the amount of content or skills I think I should address, I hate the days when we are interrupted and my whole system gets derailed, I hate feeling like there's more I should have accomplished, and I hate that my time with small groups is so limited. I try to take a step back and think about the BIG PICTURE. 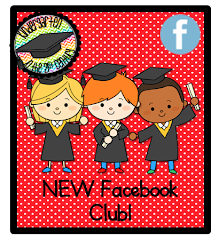 What do I really hope to accomplish in my small group time? Well, I want my students to be able to read and write independently at their instructional level and I want that level to move forward. 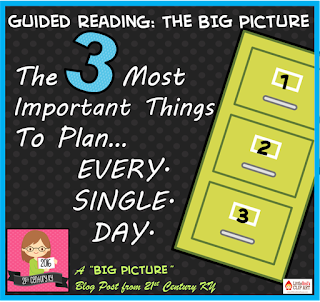 When I think about that BIG PICTURE goal, I am able to really focus on what's most important and narrow my lessons down to the 3 Most Important Things to Include in a Guided Reading lesson. Watch as I discuss what I have found to be the most important parts of a Guided Reading lesson. It's really simple when you think about the BIG PICTURE!